New Networks Claims Negligence on the Part of the State and Requests the Commission be Investigated. Special Addition to the Series "It's All Interconnected". On May 27, 2014, the New Jersey Division of Rate Counsel filed with the Superior Court, Appellate Division, a Notice of Appeal to halt a stipulation agreement between the New Jersey Board of Public Utilities (NJBPU) and Verizon New Jersey (VNJ) to erase a 20+ year plan called Opportunity New Jersey. "A $1 BILLION plan by New Jersey Bell to make New Jersey the first state to have fiber-optic communications available to virtually every household and business..."
"With fiber optics, New Jersey Bell officials say, they can create a vast network of high-speed audio, video and data services that will revolutionize the way residents and businesses in the state communicate." "Mr. Bone, president of New Jersey Bell said a 'fully fibered network would provide consumers with unprecedented access to information and entertainment services and would encourage economic development as well'." (Note: New Jersey Bell became Bell Atlantic-NJ and is now Verizon NJ (VNY)). In 1993 the New Jersey Board of Public Utilities (NJBPU) agreed to Verizon New Jersey's plan called "Opportunity New Jersey" (ONJ). And there was a trade-off -- Verizon would replace the aging copper wires of the state utility networks, commonly called the "PSTN", (Public Switched Telephone Networks) with fiber optic wires that could supply 45 Mbps or better, in both directions, to 100% of their territories by the year 2010. And in exchange for these upgrades, Verizon received massive financial incentives to do this work; the excess profits would be used for the new construction. By the end of 2013, Verizon NJ had collected over $15 billion in excess profits and tax perks for these upgrades. To read filings, documents, case study and more. Verizon deployed virtually no residential fiber optic networks from 1993 through 2006 in New Jersey, even though every year the company supplied annual infrastructure reports that claimed that they had fulfilled their obligations. In 2007, Verizon NJ started to roll out FiOS cable TV (broadband, Internet and phone) over a 'Title II", common carriage, FTTP (Fiber-to-the-Premises) telecommunication network. Based on the cable TV franchise, which was renewed in 2014, only 70 out of 526 municipalities are required to be completely upgraded. And yet, on April 23rd, 2014, Verizon NJ and the NJBPU signed a 'stipulation agreement' that erases any obligations of VNJ to upgrade to fiber optics, leaving about 50% of their territory incomplete. Worse, the Agreement allows the company to substitute any service that is the equivalent of DSL -- and this would only be required if there is no other company offering service - including wireless. To add insult to injury, the State claims that there was never any obligation for fiber optics, that Verizon received no financial benefits, that the speed is 'up to' and therefore two-cans and string are OK, and everybody, except for the State or Verizon are, well, wrong. New Networks claims that this is a case of negligence on the part of the State and we request that the Commission be Investigated by the NJ State legislature and the NJ Attorney General's Office. The rest of this article supplies actual sections of the law, statements by Verizon, and other documents and compares them to the Commission's statements. Fact: ONJ was always about a Full Fiber Optic Deployment. Fact: Verizon received massive financial incentives based entirely on ONJ. "ONJ deployment obligations and the suggestion that a surcharge tax credit or other financial benefit has been paid to Verizon -- dedicated to the deployment of broadband through ONJ. These arguments are not correct. Many argue that ONJ's obligation -- rights and obligation under ONJ is fiber build-out and that is not true." And Similarly ONJ did not require the deployment of fiber optics cable, such as Verizon FiOS." Compare this: On April, 17, 1997 then-New Jersey Ratepayer Advocate was interviewed by The New York Times pertaining to Opportunity New Jersey. "...low income and residential customers have paid for the fiber optic lines every month but have not yet benefited." Doesn't this say that customers paid for fiber optic lines, thus showing it was a fiber optic build out and that customers paid for the networks? Isn't that a financial benefit? I doubt that most of you know or remember that in 1992, then-President Bill Clinton and Vice President Al Gore based a large part of their presidential campaign on what Al Gore called the 'Information Superhighway'. It was a plan to have 100% of the US upgraded to a fiber optics, replacing the aging copper networks. And beginning in 1991, every Bell company raised their hands and said they would build it. "Opportunity New Jersey" was just one of five reports created by Deloitte & Touche including -- "Opportunity Pennsylvania", "Advantage Ohio", "Advantage Indiana" and "Advantage Illinois"-- which were written for then-Bell Atlantic (now Verizon) and then-Ameritech (now part of AT&T). "improve quality of care and cost reduction in the healthcare industry." And Bell Atlantic (which covered from Maine to Virginia) stated over and over that they were replacing the copper wires with fiber optics. An example is this Bell Atlantic 1996 press release, which laid out that the company would have 12 million homes and businesses wired with fiber-to-the-curb by 2000. Opportunity New Jersey was always about Cable Service, Not Just Broadband. "The third issue is an argument that the stipulation limits competition because the stipulation would only have Verizon build-out where consumers don't have access to broadband. These commenters argued that the stipulation limits broadband competition and Verizon has to build only where there is no other broadband. The plan that was developed in 1993 was... At the time in 1993 when ONJ was put in place, there was no broadband competition. It didn't exist. Therefore, Verizon was the only provider of broadband." There are so many problems with this paragraph it makes my head spin. Verizon had not deployed any residential 'broadband' by 1993 (with exceptions) and that was why the law was being changed. Moreover, Opportunity New Jersey was never just about broadband; it was always about cable competition. The Opportunity plans were designed to tell groups what they wanted to hear. To the regulators it was about public interest, schools, hospitals, and economic growth, while to the entertainment industry, it was always about 'interactive' cable services. 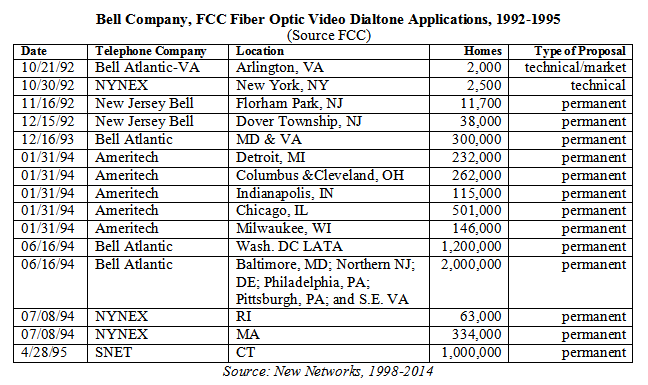 Bell Atlantic and the other phone companies had filed and even sued the FCC in order to offer cable services over fiber optic and/or coax phone lines, known as "video dialtone". And Verizon New Jersey filed for permanent deployments of fiber optics -- and it was always part of the overall "Opportunity" plan. "Bell Atlantic is deploying a fiber-to-the-curb architecture in Dover Township. This system is capable of transmitting up to 384 digital channels, where a "channel" is defined as one full-motion video transmission path, consisting of a 6 Mbps circuit..."
And the 'digital channels' was cable service. And it is clear from Bell Atlantic's releases that this network was tied directly to Opportunity New Jersey with "all" of the customers getting interactive video "during the next several years". Bell Atlantic, release, June 9, 1995. "This video dialtone network is significant to New Jersey because it reaffirms the state's historic leadership in introducing new telecommunications technology that benefits consumers, the economy and quality of life. Under Bell Atlantic-New Jersey's Opportunity New Jersey plan, we will offer interactive video capability to all of our customers during the next several years." The 'next several years' was 1996-1998, not 2006-2008. 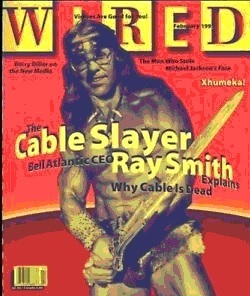 Ray Smith, then CEO of Bell Atlantic, in a cover story in Wired Magazine, February 1995, said that Bell Atlantic would have 50% of the cable business by 2000. "I would say that by the year 2000, we'll have 50% of the cable business. No doubt about it. Which is why the cable companies are in a panic. Meanwhile, the cable companies won't have even 5% of the telephone revenues in their best markets." The Requirement for Fiber Optics is in the Opportunity New Jersey Law. This requirement to do the entire VNJ territory was in the actual law, which the NJBPU did not read. Commonly called "PAR 1", fiber optics was to be deployed everywhere; Verizon NJ was to be an all fiber network. "Staff submits that it is, therefore, important for the Board to monitor ONJ and require NJ Bell to commit to achieving the entire plan, including fiber to the curb, so the projected benefits become a reality (STbl38 to STb139). Thus, in exchange for permitting NJ Bell to be governed by an alternative form of regulation, Staff recommends that it is critical that the deployment scheme described in ONJ be considered a firm commitment on NJ Bell's part." Did Verizon New Jersey Commit Fraud? Was the State Negligent? Verizon has even admitted that they didn't start the deployment of fiber optics until FiOS. "Verizon also stated that statements by commenters that Verizon's broadband obligations could only be met by fiber facilities are misguided since FiOS service as broadband did not exist in 1992." And in a Philly.com article Verizon states that FiOS started in 2004. "Verizon's Gierczynski said there was never a guarantee that FiOS would be made available to anyone who wanted it...'Nobody knew what FiOS was 20 years ago,' Gierczynski said. 'It wasn't until 2004 when FiOS came on the scene.'" We have already wrote about this timeline, the commitments, the monies collected, the rate increases, and now it is time to have the State commission investigated. 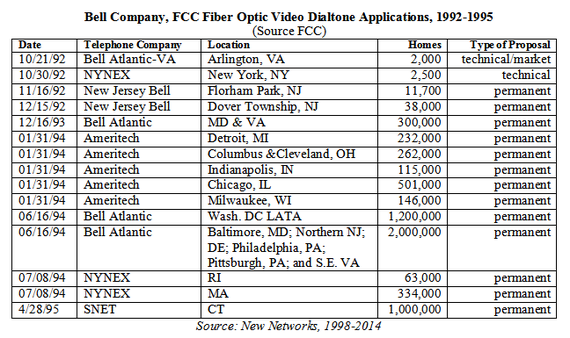 • Did Verizon NJ Rig the 'Stipulation Agreement' Comments to Erase Their Broadband Obligations? • Calling All Lawyers: Did Verizon New Jersey Commit Fiber Optic Fraud? We are glad that the NJ Division of Rate Counsel has stepped up to attempt to block this agreement. We have a few thousand documents to show that Opportunity New Jersey was a plan to have 100% of the state completed with fiber optic upgrades by 2010 with a minimum of 45 Mbps or higher, and that state laws were changed to collect billions from customers. We will be coming back to this story and tying it to the rest of the series in the next few weeks. However, downgrading a state is a serious thing. Imagine if Verizon had actually done the work and was competitive with the rest of the world, rolling out 1 Gbps (1000 Mbps) as standard to 100% of the Verizon territory and starting in 1993. Instead, the State's decision is to downgrade the State with expensive wireless or DSL that does not even compete with cable service. The stipulation agreement simply covers over the negligence by the State; they failed to enforce the laws created, the commitments agreed to and never examined the monies collected. Part 2: Dear Governor Christie: Remove Your Appointee, the President of the NJ Board of Public Utilities, Now.